Panning blur, MKT Trail, Columbia, Mo. | Canon 7D and 100mm f/2.8 Macro lens; exposed 1/6 sec. @ f/8, ISO 400. Normally, the trick to and panning blur is to have the camera on a tripod and to slowly pan downwards. This is hard to do on a ball head, but easy to do if you have a big lens mounted on a Wimberley or other gimbal-style head, or if you’re using a video head. Usually, the hardest part is going slowly enough on the pan that you get the effect that you want, but not so slow that it just looks out of focus! Start with a shutter speed of 1/15 second and slow down from there. In this example, my exposure compensation in aperture priority brought me to 1/6 sec. before I even realized it–I just heard the slow shutter and cursed under my breath. Only when I looked at it did I jump for joy. 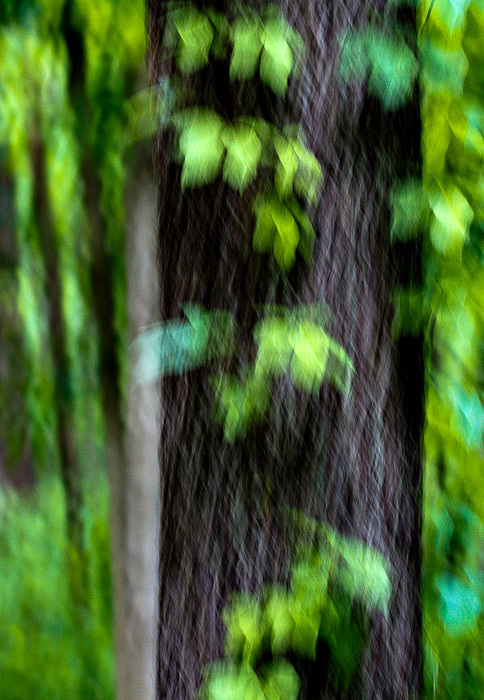 Then I tried making more blurs, and they all failed! Again, you gotta love it. Was this with an IS lens? I’ve heard the stabilizing movement can have some really weird effects when it doesn’t catch on to what direction you’re panning. No, I don’t have the newer, image stabilized version. However, The effect you’re thinking of happens when you leave IS (or VR) turned “on” for a long exposure on a tripod. But not consistently, which is the kicker. The effect is horrible when you don’t want it, but it would look really great if you did. However, because the behavior is not consistent, you can’t make it happen when you want it to. If only there was a custom function for “IS Blur: On, Off.” C’est la vie. As an aside, for hand-holding (and for tripod-based photography at fast shutter speeds) you need to leave Canon IS lenses in IS Mode 2. You could glue it in place, because there’s almost zero need for Mode 1, unless you’re in a moving vehicle photographing something else that is stationary.